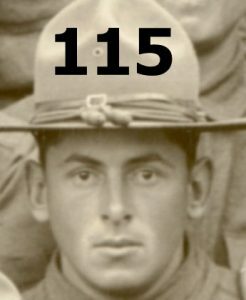 First WWI Draftees from Genesee, Orleans, and Wyoming Counties. Is Your Relative Among Them? 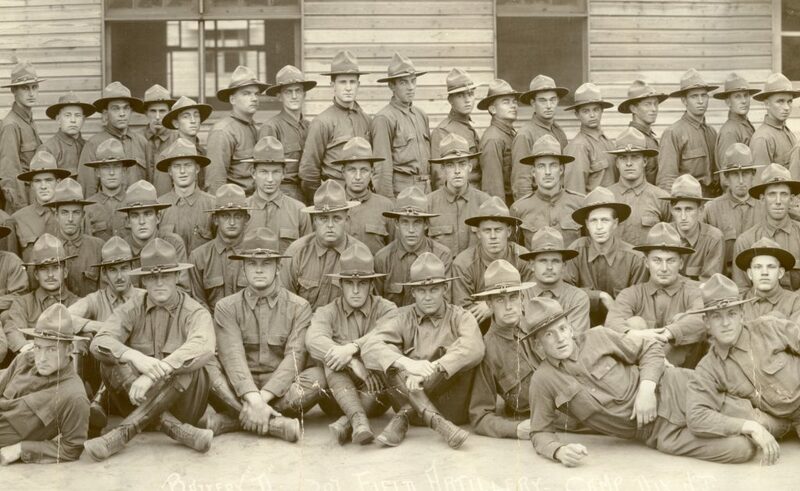 Most of the members of the first two contingents of WWI draftees from Genesee, Orleans, and Wyoming counties—over 160 men in all—are in this photo, taken in October 1917. About 85 are from Genesee County, 30 from Orleans County, and 50 from Wyoming County. In September of 1917, when the government sent the first two waves of draftees to training camps, the National Army put men from the same regions in the same units. 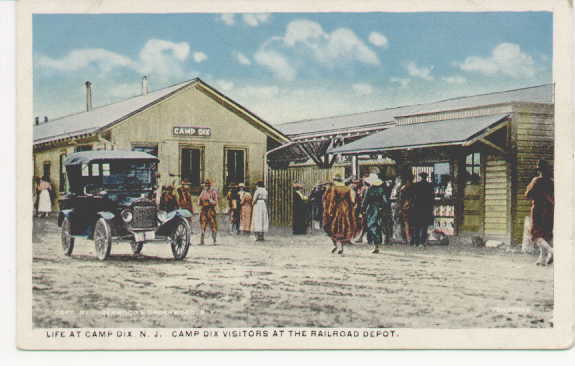 All early western New York draftees were assigned to the new 78th Division based at Camp Dix, outside Wrightstown, New Jersey. The majority from Genesee, Wyoming, and Orleans counties were initially assigned to Battery D of the division’s 307th Field Artillery. The men wouldn’t be together long. At about the same time the Battery D photo was taken, the Army began relaxing its policy of localized units, and over the next several months, though some remained with Battery D or other branches of the 78th Division, most of the men in the photo were transferred to units in other divisions: the 3rd, 5th, 32nd, 42nd, 82nd, and more. Tossed into the winds of the Great War, each would find a different fate. Nearly all served overseas. Most saw combat. Some were gassed or wounded. Ten made the supreme sacrifice. Did you have a relative in Battery D? Can you help identify him? 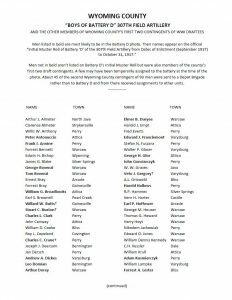 Below are lists of the names of the members of each county’s first two draft contingents. 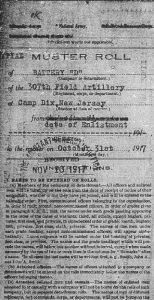 The lists have been compiled using the original Battery D muster roll (click on image to see original document), as well as newspaper articles from the time and other military records. 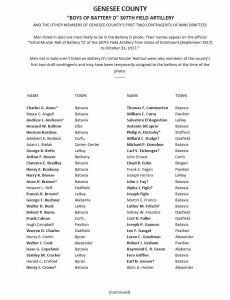 If you find a relative on the list and/or think you can identify him in the photo, please contact me. Click here to read their full profiles. Can you help identify more of the “Boys of Battery D”? Too often, our memorials to those who’ve served our country become only lists of names; over time, the men themselves become faceless. I’m hoping that the descendants of these men, and others in their communities, will come forward to help identify these men, to create a lasting document that will honor them fully, in both face and name. I’m sorry, Joseph, but I’ve searched all my sources and can’t find him. If you have additional information, such as a middle name or an alternate spelling, please let me know and I’ll try again. Thank you for visiting the site! 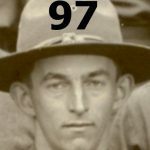 My Grandfather, Clarence M. Johns served with Battery D of the 307th and his name is listed in the roster. I have a hard cover book (History of the 307th Field Artillery) that was written by members of each of the Battery’s of the 307th. 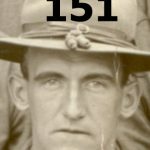 I don’t have a lot of information about his history with the Battery as he did not talk much about it but I do know that at some time during his time in the service he did fire artillery and he was also a cook as he grew up a farmer and new how to slaughter cattle so that became one of his duties. It’s great to hear from another descendant of a member of Battery D, Howard! I have some information on your grandfather that I will send you by email. In the meantime, have you given the unit photo a close look? Have you been able to pick out your grandfather? In going through some photographs from my parents wedding we have located a picture of my Grandfather (Clarence M, Johns) and my sister Donna and I are pretty sure the our Grandfather is number 93 in the picture. We still have to check with my fathers sister for her input but there is no one else in the group picture that looks anywhere close to the picture we have. 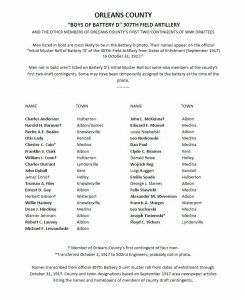 Thanks for doing this; I would love to be able to highlight your grandfather, and appropriately honor him, as an identified “Boy of Battery D.” I appreciate you taking the time to look carefully before declaring a positive identification. Recognizing relatives through time in photos can be difficult, and it’s important to be sure. Let me know what your father’s sister thinks. Also, if you can scan or photo the wedding photo and email it to me, I could take a look, too–sometimes an objective eye helps.